For marinade, in a small bowl combine lemon juice, olive oil, garlic and tarragon. Place pork chops in a 1-gallon self-sealing plastic bag; pour marinade over chops; seal bag. Marinate in the refrigerator for 6-8 hours or overnight. Place chops on rack in broiler pan so the chops are 4-5 inches from heat. Sprinkle the chops with a little paprika. Broil for 5-8 minutes or until brown. Turn chops and sprinkle with paprika. Broil for 5-8 minutes more or until chops are just done. Simple marinade that young chefs can help with. 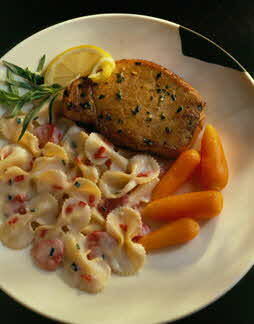 Serve with pasta salad and glazed baby carrots.